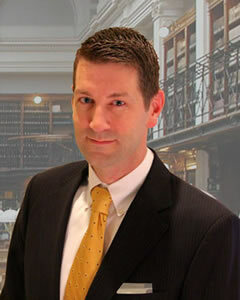 Nathaniel joined Otterstedt, Ellenbogen & Kammer in 2012 and has been practicing before the U.S. Patent and Trademark Office since 2001. He holds a Juris Doctor degree from St. John’s University School of Law, a certificate in computer science from Hofstra University, and a Bachelor of Science degree in biology from the University of New Hampshire. Nathaniel is a registered patent attorney with patent prosecution experience in various technical fields such as software technology, including financial technology, medical imaging, data mining, speech recognition, audio and visual compression, and blind source separation; network technology, including content streaming and collaborative systems; semiconductor technology, including memory devices and carbon-based nanotechnology; liquid crystal display technology; and biological testing systems. Nathaniel is admitted to practice before the U.S. Patent and Trademark Office, the U.S. District Court, Eastern District of New York, and in the state courts of Connecticut and New York.